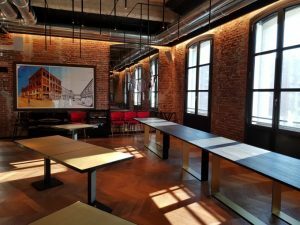 EDIT is located in a post industrial area of Turin, Italy and is a new concept in modern living and the shared economy with 2,400 square metres spread over 2 floors. The local urban redevelopment includes parks, museums, design studios and art galleries as well as residential. 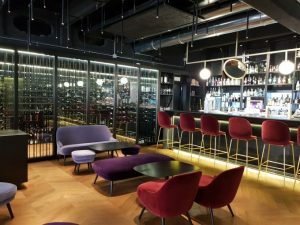 EDIT – Eat, Drink, Innovate, Together – the venue has a fully operational bakery, a coffee bar sponsored by Lavazza, a ground floor kitchen area with shared dining space and innovative cocktail bar. The first floor dining area features a show kitchen operated by a Michelin starred chef. In addition there are four fully fitted professional kitchens that can be hired for demonstration cooking or just for your own use. This can be used with a private dining room area as well. To complete the experience there are also 20 apartments – with EDIT covering your food and drinks needs you may never need to leave the building! 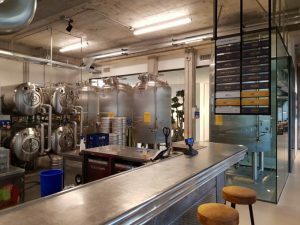 However at the heart of this co-sharing economy is a lacquered stainless steel finish, show piece brewery, visible behind the bar. The 12 hectolitres high performance brewhouse from Simatec Srl of Turin is complete with 4 dpv’s or Unitanks and also one double batch dpv. Of the 19 taps on the bar some of them can be fed direct from one of four Simatec serving tanks giving a very fresh beer experience. The serving tanks are horizontal to save space but also fitted with internal bags to keep the beer in the best serving condition from the first taste to the final glass. 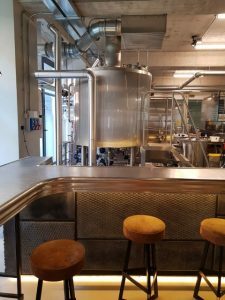 Currently the brewery is producing three different beers that current includes a Pils, a bock and also an American Pale Ale. Over 80 different beers are available on site either on tap, in bottle or can. Features of the brewhouse include a multifunction vessel and a separate lauter. The Simatec system is designed to as flexible as possible and easy to use. It is possible to rent the EDIT brewery as a gypsy brewer or just a group of friends. The results given by the brew house include low hot oxidation, much reduced filtration due to a cleaner wort and also a high extract rate due to the special design of the lauter. This also allows a wide variety of alternative or additional ingredients to be used in the brewing process such as fruit, nuts and plant material such as twigs! A condensing column instead of a flue ensures that planning permission is more easily gained as there are no odours exhausting to atmosphere from the copper. Another key feature of the system is the modularity. This allows you to double production on the existing plant but adding only one vessel. The process does not change either, as the new vessesl is operated as a separate brew stream…… with the larger brew houses we can produce up to 13 brews per day. 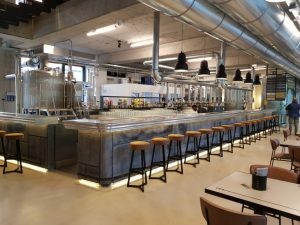 The system can be upgraded in stages so that as the business grows the brew house grows but without disruption or changes of the plant or brewing process! A unique system called Top Modular only from Simatec who have their own award winning brew house established 15 years ago. The cellar was supplied from Simatec with an isobaric hop injector to allow dry hopping in the Unitanks without wasting hops as so often happens when hops are just thrown in the top. A mobile CIP set, mobile filtration set along with a small kegging unit complete the processing and packaging supply. Simatec also supplied the steam boiler, chiller, interconnecting pipework and water treatment plant too to give a turnkey project. Simatec brew houses and plants are partnered with Enterprise Tondelli for the UK and Eire market. The brew houses are from 3 hl to 96 hl and many sizes in between. Enterprise also supply bottling, canning and kegging lines along with ancillaries. This means from single machines to complete turnkey projects from one source.